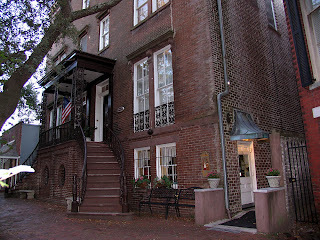 One of the best places to eat in Savannah has got to be Mrs. Wilkes Dining Room. There is usually a line waiting outside but as one person who left the restaurant said, "it's worth the wait". 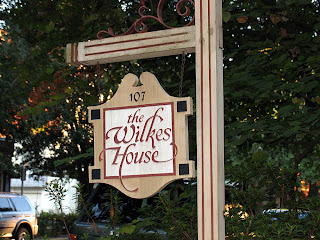 Located in the basement of one of the beautiful old houses on Jones street, Mrs. Wilkes' is like having a big family lunch at your grandmother's. You are seated at one of the large tables which seats ten people (it's communal eating style) and then the food arrives. Lots of it. The menu does change from day to day but when I was there I had a choice of all the southern food I wanted; fried chicken, meatloaf, black eyed peas, mac 'n cheese, mashed potatoes, stuffing, sweet potatoes, creamed corn, collard greens, baked beans, beef stew, corn bread, biscuits, okra and tomatoes, and turnip all washed down with as much sweet tea as I wanted!! There was SO much food that the table was covered. Everyone passed the plates around and took their share. This was lunch. I can't imagine what would be served for dinner. For dessert, everyone had a creamy banana pudding. Yum. Like good little guests, we were asked to take all our plates over to the kitchen area when we were finished. The cost was $16 not including tip. Sadly, Mrs. Wilkes is no longer with us but her family continues to run the restaurant. This is Savannah so maybe she still watches to make sure everyone gets well fed. Labels: Mrs. Wilkes boarding house. Eat your heart out, Paula Deen.